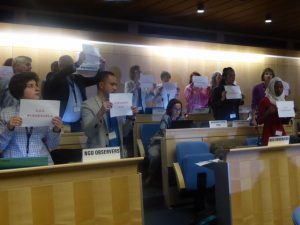 29 June 2017–Geneva, Switzerland — At the 40th meeting of the UNAIDS Programme Coordinating Board (PCB), ICASO Executive Director Mary Ann Torres made an intervention regarding the dire situation facing people living with and at risk for HIV in Venezuela. 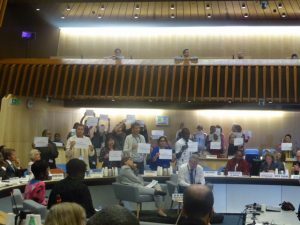 During her remarks, others in the room stood up and held signs reading “SOS Venezuela,” in a visual demonstration of support. The full text of her intervention is below, in English and Spanish. Some photos of the session are also included at the bottom of this post. “My name is Mary Ann Torres, executive director of ICASO, based in Canada. You have heard over the last two days here – and perhaps over the last few months in the news, about the humanitarian crisis in my home country of Venezuela. This is a crisis of many facets, but it is above all, humanitarian: people are dying of hunger. People are dying of preventable, treatable infections. Our friends living with HIV are dying of AIDS. Let me summarize the situation borrowing the words of journalist Stephanie Nolen: there is nowhere in the world today where people are dying of AIDS at the pace and in the sheer numbers that they are in Venezuela. There are an estimate of 300.000 people living with HIV. There are at least 11.000 new infections every year. In 1999, 1242 people died of AIDS-related complications. In 2015, that number more than doubled. Shortages in medical equipment have meant ‘recycle and reuse’ (including needles, test tubes, etc), regardless of the risk of disease transmission. People are dying daily of TB, hepatitis, toxoplasmosis and other opportunistic infections. There is no treatment for hemophilia. People are dying of diarrhea because there are not fluids to treat it. Stock outs of ARVs have been going on for months, with 70% to 90% of treatment absent from the distribution chain. 80% of people living with HIV are without treatment today, and they will be until at least until the end of August. In 2011, a study revealed that 10% of the WARAO population (an indigenous group in the northeast of the country) were living with HIV. Further research has determined that this may have doubled by now. We urge allies around this room to respond to this humanitarian crisis, looking beyond the limitations of policies, politics and income classifications. We ask you to look beyond the government’s reports and data and to invest – yes, invest resources- in strengthening community systems in particular to get the most accurate information about the crisis. We ask that you continue facilitating and start providing immediate concrete assistance. “Mi nombre es Mary Ann Torres, Directora Ejecutiva de ICASO, basada en Canadá. A lo largo de los últimos dos días acá – y quizás también a lo largo de los últimos meses en las noticias – ustedes han escuchado sobre la crisis humanitaria en mi país natal, Venezuela. Esta es una crisis que tiene muchas facetas, pero sobre todo, es humanitaria: la gente muere de hambre. La gente muere de infecciones prevenibles y tratables. Nuestros amigos viviendo con VIH están muriendo de SIDA. Permítanme resumir la situación tomando prestadas las palabras de la periodista Stephanie Nolen: no hay lugar alguno en el mundo hoy donde la gente esté muriendo de SIDA al mismo ritmo y en los preocupantes números que en Venezuela. Existe un estimado de 300.000 personas viviendo con VIH. Hay al menos 11.000 nuevas infecciones cada año. En 1999, 1242 personas murieron de complicaciones relacionadas al SIDA. En 2015, ese número es más del doble. La escasez de equipos médicos ha significado “reciclar y reusar” (incluyendo agujas, tubos de ensayo, etc. ), dejando de lado los riesgos de transmisión de la enfermedad. 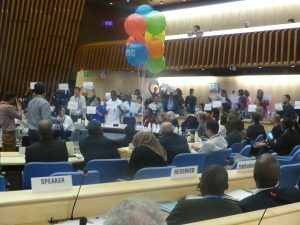 La gente está muriendo a diario de tuberculosis, hepatitis, toxoplasmosis y otras infecciones oportunistas. No hay tratamiento para la hemofilia. La gente está muriendo de diarrea porque no hay fluidos para su tratamiento. Los inventarios de antiretrovirales se han ido agotando por meses, con 70 a 90% de los tratamientos ausentes de las cadenas de distribución. 80% de las personas viviendo con VIH no cuentan con tratamiento hoy, y estarán así por lo menos hasta finales de agosto. En 2011, un estudio reveló que 10% de la población WARAO (un pueblo indígena en el noreste del país) vivía con VIH. Mayores análisis han determinado que esa cifra puede ser el doble actualmente. Urgimos a nuestros aliados en esta sala a responder a esta crisis humanitaria, mirando más allá de las limitaciones de las políticas, la política, y las clasificaciones basadas en ingresos. Pedimos que miren más allá de los informes y los datos del gobierno y que inviertan – si, que inviertan recursos, en el fortalecimiento de los sistemas comunitarios en particular, para así obtener la información más precisa de la crisis. Pedimos que continúen facilitando y comiencen a proporcionar asistencia inmediata y concreta.